Loyola Student Affairs wins top JASPA award — M.L "Cissy" Petty, Ph.D.
On March 12 – 13, 2011, I attended the annual spring conference for the Jesuit Association of Student Professional Administrators (JASPA), hosted by Saint Joseph’s University. Members of JASPA represent the 28 Jesuit colleges and universities in the United States and also include affiliate members from other institutions. JASPA’s goal is to work to promote the mission of Jesuit higher education. Each year, JASPA members honor campus leaders, programs, and initiatives for contributions and influence to Jesuit higher education. 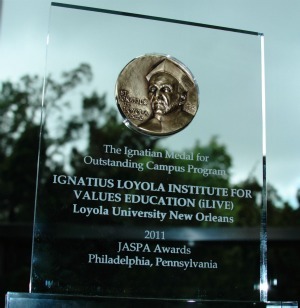 I am proud to announce that during the conference the 2011 Ignatian Medal for an Outstanding Campus Program was awarded to Loyola University New Orleans in recognition of our program, the Ignatius Loyola Institute for Values Education (iLIVE). The Ignatian Medal for an Outstanding Campus Program is the only Ignatian Medal awarded to an institution rather than to an individual person. Student Affairs work uses programs and services as the tools to meet students’ needs and to resolve conditions on campus which impede the educational process. Programming is a creative process, one which requires a multiplicity of skills and talents. Good programs are often shared among campuses, and certain programs stand out from all others for their creativity, focus, adaptability to different campus environments, and for their proven effectiveness. The iLIVE program provides each undergraduate student strategic co-curricular experiences and opportunities to discover, develop, and apply principles for building ethical and meaningful lives. iLIVE gives students ways in which to learn and live the values of Loyola University New Orleans, enhance academic commitments, and transition into lives of service to others. Formed by Jesuit and Catholic values, iLIVE sponsors programs and activities encouraging the processes of reflection and discernment, which leads students to define their personal ethical code. Activities include intentional exposure to wellness initiatives; speaker and lecture series on current issues and leadership topics; career discernment; commitment to diversity; character development; and service. Of course, institutions don’t create programs; people do. The honor of this award belongs to the many Student Affairs professionals at Loyola who have worked during the past four years to make iLIVE a success.